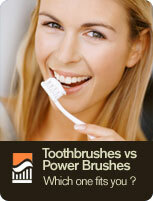 An electric toothbrush utilizes electric power to move the brush head. The first of its kind, dubbed "the Broxodent," was introduced by Squibb Pharmaceutical at the American Dental Association's Centennial in 1959. The electric toothbrush was originally created for patients with limited motor skills (since this modern brush does not require a great deal of dexterity to wield) as well as for orthodontic patients, or patients with braces. While the latest research finds that the electric method is more effective than manual toothbrushes, since it cuts down on brushing errors, other studies continue to conclude that manual tooth brushing is equally successful. In support of current research, what are known as "rotation-oscillation" electric toothbrushes did indeed out-perform manual brushing, removing around 7% more plaque and leading to 17% less gum disease than manual brushes. These "Rotation-oscillation" toothbrushes perform, as the name aptly indicates, with rotating bristles. Their bristles are either arranged in a circular format that rotates or oscillates on the whole, or alternatively, the individual tufts of bristles contained in the brush head each take on a spinning motion. Ordinarily, Rotary electric brushes generate between 3,000 and 7,500 brush strokes per minute.